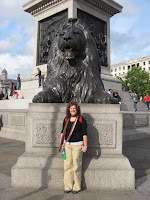 Europe Adventures: London - Pip pip! Another day of oversleeping.... stinkin' time change is still getting the best of us. After rolling out of bed and having a wonderful proper shower we headed out to explore the street around Susannah's place. We headed into our first catalog store that totally confused us at first but by the end we thought was a pretty smart idea. Charlie got a new memory card (yeah we can put up photos). We enjoyed our second lunch of tasty fish and chips. We grabbed a train then the tube back into downtown London. 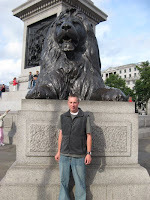 We exited on Trafalgar Square and Lord Nelson's monument (he fought Napoleon), really big lions and pretty fountains. The National Museum was right on the square and we spent a little under and hour before they closed trying to see it all. We saw Monet, Picaso, Leonardo DiVinci, Michelanglo, Raphale, Degas, Renoir, and a million other things that totally moved and impressed us. After the National museum we wondered into China town, Soho and other little parts of London. It was so busy at all the pubs we decided to head back south and grab dinner at the local "cheap" pub. Chili and rice and cottage pie.... yum. We are trying to call it an early night tonight just to get back on track and not over sleep... wish us luck!! Only one more full day in London, I'm already a bit sad. But I'm guessing I'll cheer up in Amsterdam. PS (parents don't read any further) we saw a crack deal go down at the train station, pretty sketchy. ooh how exciting! i bet you were waiting for people to surround you and start singing from the "Sound of Music" when there were all those fountains and statues! Thats the first thing that i thought of. Take a picture of the Tube -- im curious to see what it looks like!! once again Miss you guys! p.s. any time you see a good deal on a 'foach' (coach) get if for me - ill send you money for it!! London - What's all this then?